Get better workouts every day with the elevated XL Doorway Pull Up Bar by Ultimate Body Press. 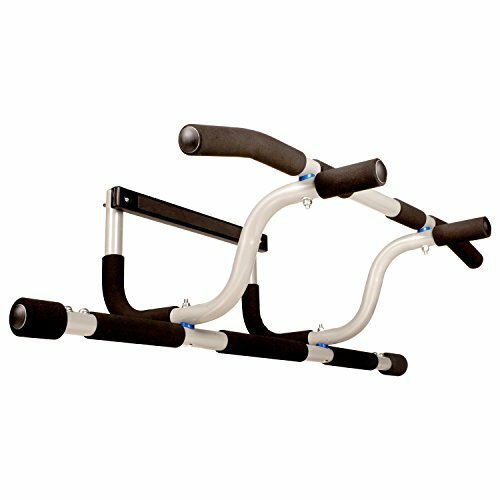 With wide diameter heavy steel tubing, premium hardware, exclusive ABS bar couplers and long lasting high density foam padding, The XL Doorway Pull Up Bar combines stable workouts with incredible range of motion. Three grip positions target individual muscle groups across the chest, arms, back and core with a super quick change over to floor exercises as a push up and dip stand and as a brace for sit ups. The elevated bar is great for taller users and gives you full range of motion for pull ups and expanded exercises with optional accessories like suspension trainers and ab straps (accessories sold separately). Expandable bar ends make the XL Doorway Pull Up Bar a universal fit for residential doorways 24 – 36” in width without screws or drilling. Assembly is straight forward with all hardware and tools provided and you can shop with confidence, the XL Doorway Pull Up Bar is backed with our 100% satisfaction guarantee. • Prime eligible shipping and Ultimate Body Press 100% Satisfaction Guarantee. You will love owning the this bar and the workouts, or we will refund your money. Doorway pull up bars have rightfully earned the respect of fitness enthusiasts. Great workouts at home start with pull ups and the convenience of having you bar ready to go at a moment's notice makes it easy to build on your results daily. The addition of the elevated bar extends your range of motion and brings home the kind of performance you expect from the mounted bars at the gym. To handle the added leverage of the elevated bar, the Ultimate Body Press XL Pull Up Bar uses the thickest steel, quality hardware and our exclusive ABS couplers so each crossbar can be properly tightened and locked at 90° to the uprights. You feel the difference on the wall with every rep and most importantly, the XL Doorway Bar retains it's shape under strenuous floor exercises. The elevated doorway bar that supports your confidence leaves you free to focus on form and repetition for the results you want in less time. If you have any questions about this product by Ultimate Body Press, contact us by completing and submitting the form below. If you are looking for a specif part number, please include it with your message.